Bansko is an ancient and beautiful town located at the foot of the mighty Pirin Mountains in southwestern Bulgaria. The mountain range is protected by a Unesco World Natural Heritage order. It is also home to Bulgarias most prestigious ski resort which has hosted a number of FIS World Cup Ski events. The summit of the ski area on mount Todorka rises to an impressive 2,600 m (8,500 ft) above sea level. The vertical drop back down to Bansko is a little over 1,600 m (5,200 ft). The ski area has 75km of ski runs served by 27 lifts. The lift system has the capacity to serve 24,500 people per hour. Queues are therefore pretty small on the mountain. The queue for the main access gondola can however be relatively long for a short period after 9am. These busy times can be easily avoided. The Ski School TV studio apartment is across from the lift station and provides a perfect vantage point to assess any queues. The close proximity to the gondola station makes it very easy to beat the morning rush altogether. Bansko is a fusion of rustic eastern European charm and modern western ski resort. The old town has cobbled streets, markets, churches and ancient monuments. The modern part of town comprises tastefully constructed ski apartments, shops and a huge variety of restaurants and bars that cater for a bewildering array of tastes and budgets. 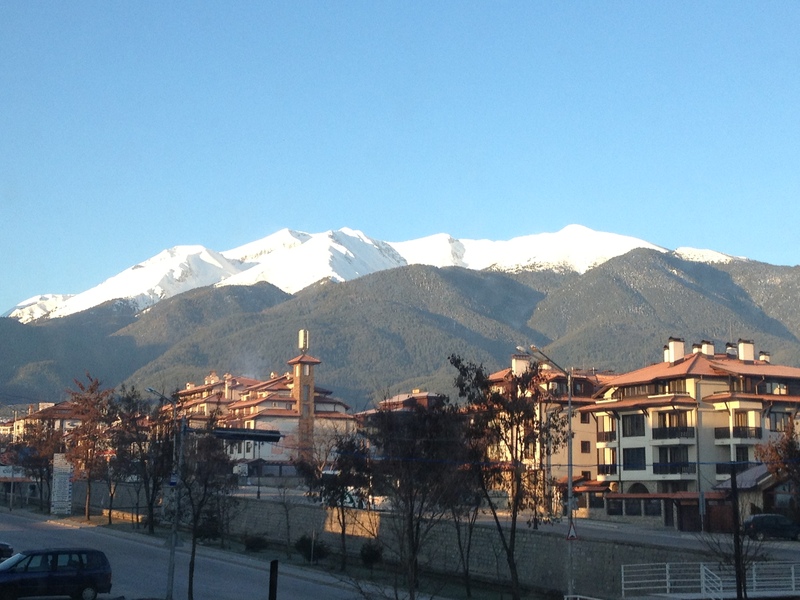 For more in depth information about Bansko including ski hire and lift pass discounts please check out BanskoBlog.com. Last winter I did a couple of snow reports and enjoyed a few days skiing with Lance Nelson the creator of BanskoBlog. The short snow report vídeos below show some of the pistes and how picturesque the tree lined slopes are. I thoroughly recommend the easily downloadable BanskoBlog App. It provides great resort information, webcams, an accurate daily weather forecast and in resort discounts.